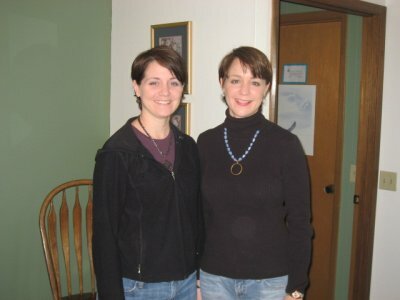 Lately my sister, Lynette, and I have been mistaken for twins. We took this picture at Thanksgiving. I’m taking a poll–Do you think we look like twins? ~ by legmaker on December 1, 2007. I don’t know your sister, but you definitely look like sisters! Which means that I would say you look like non-identical twins. I think the resemblance may come more in the fact that your hairstyles are similar, and that you are the same height, etc. If I saw your sister without you, I don’t think I would mistake her for you! BTW, I am so glad you guys started a blog! Looking forward to being able to keep up with your life a little bit =) We sure miss you guys! We’re looking forward to being back in Indiana in a few months, but will miss you!!! Hey Lisa! Congratulations on the marathon, by the way. I’m not sure if I have ever met Lynette, so I have to say, if I saw her one day randomly, I would do a double-take and wonder if it was you I was seeing. And I probably wouldn’t be sure until I clarified it with her. I would DEFINITELY have to ask her if she knew you, even if she was a random stranger. So I agree with the non-identical twins. I like ya’ll’s hair, by the way. Well, if not twins, then *definitely* sisters (I can see how someone might make the mistake)! I’m so glad you started blogging! We’re looking forward to keeping up with you here.